Razel giggles as she pushes open another door of a wooden, stilted house. Behind the closed doors of Falam, one of the main towns in Myanmar’s remote Chin State, are dark rooms housing traditional back-strap weaving looms. Cotton threads in red, green, purply-blue and a golden yellow, the base colours of Falam designs, extend the length of the loom, which is fixed, at one end, just below waist height to the wall. Razel’s ‘sister’ sits on the floor, her backstrap pulling the threads tight as she uses a quill of a porcupine to work the yarn across the loom, creating a detailed, diamond-shaped pattern. Many years ago, I stumbled upon some quite striking fabrics in Yangon’s Bogyoke Market. These, the sales-lady told me, had been hand-woven in the mystical Chin hills, which, at that time, were off-limits to international travellers. Impressed by the intricacy of the patterns, I promised myself one day I would venture to the Chin State and observe the making of these beautiful pieces. Perhaps due to the Chins’ geographical isolation, the tradition of backstrap weaving has survived. 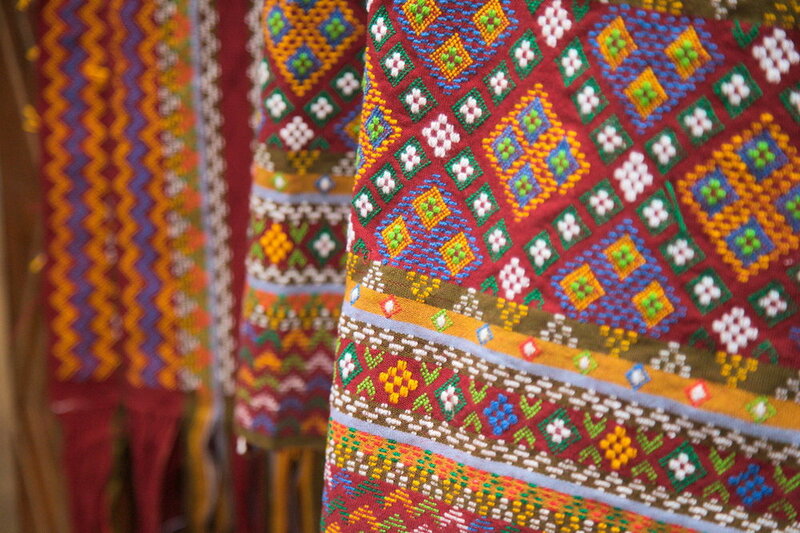 Each tribe has its own unique colour systems, depending on which plants were locally available to create dyes, and also distinct weaving styles. This means the traditional dress changes as you move throughout the region. For example, while Falam patterns are made up of colourful geometric designs, the Zomi Chins, who live around Tiddim, the next main town to the north, concentrate on striped patterns of black, green, white and red. Meanwhile, the Mizo, a Chin group just over the Indian border in Mizoram, start with a white base and add strips of black, red, yellow and green to create a striking check. Chin women are famed for their weaving throughout Myanmar, although I have read that today, compared with 30 or 40 years ago, very few still know how to weave using this traditional technique. Razel, however, has just revealed half a dozen working looms within a few minutes of her house, and she guesses around a fifth of households in Falam town have a woman that knows how to weave. Chinland, as the locals call it, is a mountainous, inaccessible state in the west of Myanmar. One of the poorest and least developed states in the country, it is home to the ethnic Chins, who are predominately Christians. This group, of Chinese-Tibetan descent, is actually comprised of at least 50 tribes, who speak distinct, mutually incomprehensible ‘Chin’ languages. In most circumstances, Chin people are forced to revert to Burmese to communicate with those from other Chin tribes. Historically, the Chin people governed themselves, through a web of local chiefdoms. Their territory encompassed what is now the Chin state in Myanmar, along with parts of Mizoram, Manipur and Bangladesh. When the British arrived, the Chin lands became part of the empire, but the local chiefs were allowed to retain some level of autonomy. Independence then led to the Chin tribes being separated by international borders, decided on political, not ethnic considerations, and these areas were absorbed into the region’s new countries. Razel was taught by her amicable, but firm mother, Mrs Run Mawi. Mrs Mawi tells me she has been weaving since the age of 12, which I’m guessing is over 40 years as Razel is now 35. I try to ask if Razel would pass the skill to her children, but the meaning of my question gets lost in translation. I manage to glean that her ‘sister’s’ daughter knows how to weave but doesn’t have time as she is now a school-teacher. Mrs Mawi demonstrates the traditional male and female Falam outfits to me. A man would wear a white shirt, with a Falam-patterned, wide sash sitting on one shoulder and falling loosely at waist-height on the other side of the body. A female would wear a longyi and short-sleeved, v-necked top, again both covered with colourful Falam designs. The outfit would be completed with a black scarf adorned with pinks, blues and greens, and multiple bulky, red and yellow glass necklaces, thin metal belts and chunky bracelets. Traditional Chin dress is now only worn at weddings or special occasions, such as Chin National Day. But the garments are still in demand and her customers, Mrs Mawi says, order at least a year in advance. 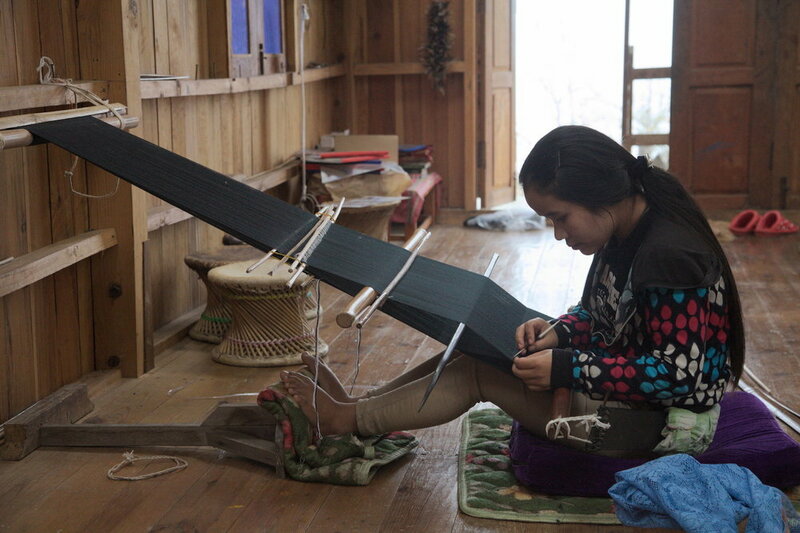 It can take a skilled backstrap weaver up to two months to make a traditional style woman’s longyi. Machine-made longyis, pouring out of the larger towns in the Burmese plains, take a fraction of the time to make, allowing them to be sold for less than half the price. Unsurprisingly, the local Chins, a relatively deprived population, are mainly opting for these cheaper alternatives. Not seeing a future in the profession, women are not concerned with passing the skill to their daughters. 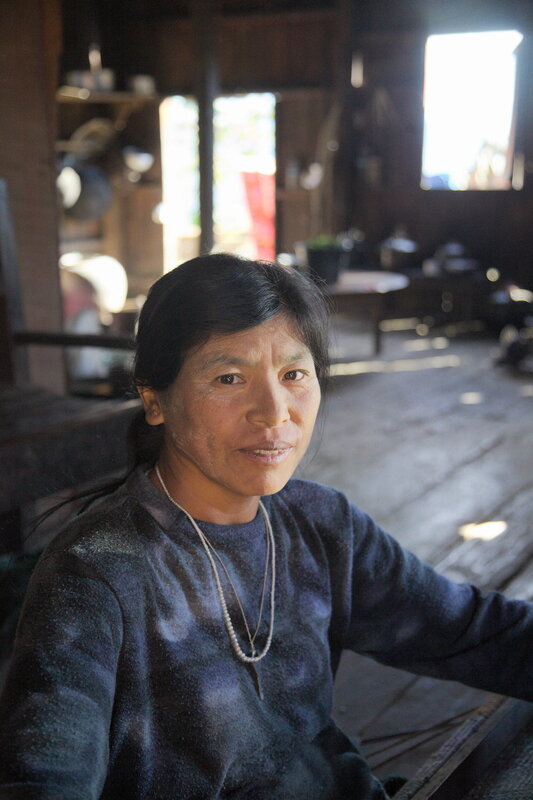 I return to Falam and call again on Mrs Run Mawi and Razel. Mrs Mawi holds my hand warmly, and proudly tells me of a time when Aung San Suu Syi visited her home and invited her to live in Naypyidaw, the nation’s capital, to make traditional Chin clothes. There she would be given a steady stream of business and her skills would gain an unprecedented amount of recognition. But, she didn’t go. She told Suu Syi she didn’t want to live in such a hot place and leave her mountain home behind. 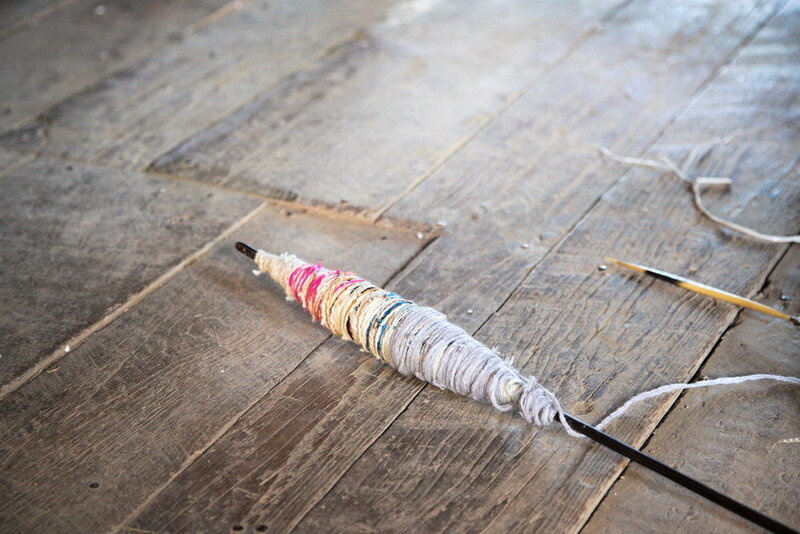 “There is nothing I don’t know about weaving,” she says confidently. As I watch her fingers dance in front of me, I am inclined to agree. She shows me a pattern catalogue that she is compiling of the traditional design of the Lai Chins (the Chin group found around the town of Hakha). She explains designs can be unique to individual weavers and were often inspired by the environment around the weaver. She points to one called ‘a hen and her chicks’ where large diamonds are surrounded by small imitations. In an effort to modernise the industry, in addition to traditional designs, Aidii offers a set of new, more contemporary sets designed by Anna herself. Scrolling through the Aidii Collections Facebook page, it appears these new products are selling out rather quickly. Follow Eileen’s Travel’s here and here.